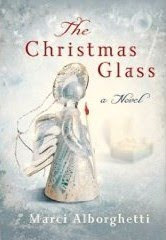 The Christmas Glass begins in 1940 with Anna, an Italian widow, sheltering a few Jewish children at her orphanage. Knowing the danger, Anna reminisces about her family's precious "Christmas glass," 12 beautiful hand-blown ornaments, as she wraps each piece to send to a cousin for safekeeping during the war. Part I, above, was my favorite part of the book, only about 17 pages. Part II, starting on page 23, begins in America in the year 2000. Ahh, if you've read any of my book reviews, you know contemporary settings are my least favorite! I would much rather have heard more about Anna or perhaps her cousin Filomena's immigration to America with the precious "Christmas glass" after the war. Instead, the year 2000 brought with it too much angst and worldliness for me. While it is true that no one is perfect and we all have problems, Filomena's family is certainly more than dysfunctional, and I felt tense reading about each character. Filomena has distributed each piece of the once treasured Christmas glass (which was never to be separated) to family and friends throughout the years. Now, nearing her final Christmas (or is it? ), she manipulates them all to Connecticut, hoping to heal and restore some relationships. Honestly, it was like when you hear someone's salvation testimony and all they do is talk about their former life and all the sin they were in. They spend 98.9% on their awful life and only 1.1% on the Lord. The characters and relationships were so crazy, and often hateful, that I winced as I read. I really loved the idea behind the book...but, it didn't take the direction I was hoping for. Still, I appreciate Marci, through CFBA, for allowing me to review The Christmas Glass!